Ripe cherry tomatoes are super sweet and especially kid-friendly. Make this pasta salad for your end of summer picnics using the last of the in-season tomatoes. Combine the chilled pasta, cherry tomatoes, black olives, and Parmesan cheese in a mixing bowl. Set aside. 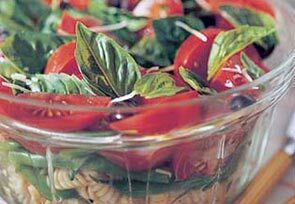 In a medium bowl combine the red wine vinegar, Dijon mustard, minced garlic, salt, pepper, sugar, and dried basil. Slowly add the vegetable oil while whisking. Pour the vinaigrette over the pasta. Gently stir until the salad is well coated with vinaigrette. Mix in the fresh basil just before serving. Basil will turn brown from exposure to the vinegar. Per serving: 231 calories, 15 g fat, 1 g saturated fat, 247 mg sodium, 21 g carbohydrate, 3 g fiber, 5 g protein. Tried our recipe? Tell us what you think! Leave us a comment below.